It flies fine, but seems to drift a lot in GPS mode. (I waited for GPS lock and Home lock rapid green flashes). I've calibrated the compass, but I thought I should check the firmware as I guess it still has the original factory firmware. I'm having real difficulties getting the DJI driver to work, as many other people have in my situation (Windows 10). So far I have Windows in test mode, so I can load the unsigned driver successfully. I've disabled my AV software etc. This is as far as I can get. The driver is loaded, but won't start. I made sure to use the correct version (x64 for x64 Windows). Anyone else had this issue, have any advice? Expensive ? if you paid anymore than £100 for a P1 then you were ripped off, that said to answer the question have a look at this webpage for help with code 10 issues, once sorted you need to do an IMU calibration. £150, so not too bad. I've followed every guide I can find for the issue. The driver is installed, but won't start. I've tried all the troubleshooting that I can find, and nothing has worked. Maybe it's just a lemon. EDIT: I tried on another PC, same setup, same process, and it worked. Bizarre. Are you using a USB 3 or USB 2 port ? 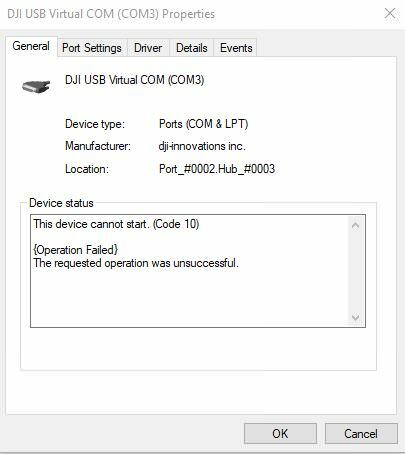 I have noticed several times that the DJI drivers do not work well on USB 3 ports.